Small businesses constitute an essential element of the economy. However, with rapidly expanding small business lending, small business owners are facing difficulty to qualify for business loans from banks and other conventional lending sources. However, there are numerous small business loan alternatives available in the lending market to secure working capital for your business. In addition, small business financing from alternative lenders are convenient to apply online as they involve less paperwork. Small business loan alternative lenders approve funding requests immediately in minutes and funds money within hours. The approved funding can be used for any business related purpose, as there is no obligation on the usage of funds. When to choose Business Loan Alternatives? Small businesses, in general, function on a fixed finances and hence may require extra budget in order to take advantage of the business growth opportunity. Sometimes, if your business fails to meet the requirements associated with the conventional bank loans, a small business financing from an alternative lender can ease the burden of additional funding needs. Avail Smart Business Loan Alternatives with Business Capital USA. Business Capital USA represents a dependable and direct alternative business loan lender. 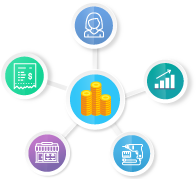 Our unique business cash advance programs are designed to meet the specific needs of different categories of small businesses. At present, we provide the following business funding options. With Business Loan Alternatives from Business Capital USA, you can do much to your small business. Look further than conventional lending sources and avail potential capital source from alternative lending options for small businesses. I was in need of extra financing to upgrade my commercial kitchen. I availed restaurant financing from Business Capital USA and was not disappointed. Besides, I have nothing to worry with the manageable repayment option. Business Cash Advance is truly a quick and renewable capital for small business. Unlike SBA loans from banks, it is lot easier to gain access to the required working capital. Thank you for the help.